As the real fight continues in Michigan, Lifetime’s TV movie, starring Queen Latifah and Betsy Brandt, chronicles three women who join forces to save their hometown during the devastating saga. overing that the drinking water in Flint, Michigan, is contaminated and causing a slew of devastating medical problems for their families. The Flint water crisis is an environmental scandal that has not been resolved: As recently as July, tech mogul Elon Musk pledged to “fix” the water there. Neil Meron, who executive produced the TV movie with Craig Zadan, recounts for THR how they and the filmmakers confronted a unique challenge: How to tell a story that is far from over. How did you decide where to start and end this story? There was a Time magazine cover story that I read that talked about the women, the housewives, the mothers of Flint that really were responsible for uncovering exactly how this happened. I thought that was our entry point — to tell the story of these remarkable women who were just trying to protect their families and their children and how they became warriors. We knew going in that there was not a satisfying ending. There was not a happy ending — but we decided that we would end it at a point where the women uncovered the truth and then what happened after that. 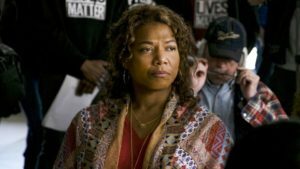 How did you balance telling a true story with taking some artistic liberties (like Queen Latifah’s character being an amalgamation of a few women from Flint)? As far as we know, everything that is in the film more or less did happen the way that it was portrayed. So there was enough drama in the actual story that we didn’t really have to do much. We relied heavily on telling the story of the women as opposed to other people that may have been involved in the story in different capacities. This is not your first project with Latifah. How has that relationship grown? She has developed into one of our dearest friends and closest collaborators. We did Chicago and then Hairspray and then Steel Magnolias, which also was a breakthrough for Lifetime in that it’s still its highest-rated movie. We knew she would respond to this, and her involvement made the spotlight on the story that much bigger. With many still suffering from the crisis, do you ever have conflicting feelings on how grandiose the awards circuit can be? Any recognition for this film just sheds more light on the subject of what’s going on in Flint. It’s wonderful that we’re nominated, and the good side of that is the fact that the problems of Flint will be recognized again. So I don’t see it as a negative at all. One of the great things we did is that Lifetime arranged a screening in Washington for Congress. People are still suffering, but maybe efforts like this could alleviate some of that.